Early last month I summarised the various octagonal and decagonal telescopes in the collection, then set about updating the overall listing: surprisingly perhaps I found another very old Octagonal scope, and in fact it is one I had been worried about, as I had promised to tell the Ebay vendor about it, when it had been renovated: but it had got misplaced. It was bought from a lady near Bournemouth, in February 2014. The photos here show it has not yet been cleaned up in any way! The scope is mahogany, planed down to be eight sided, with a single brass draw. This draw is retained within the mahogany barrel, and has three in-line joints: the maker’s name is engraved on the second section of the single draw, which would seem unusual. However there is no way that the first two sections could have been transposed, as the threads are not compatible in any different order. 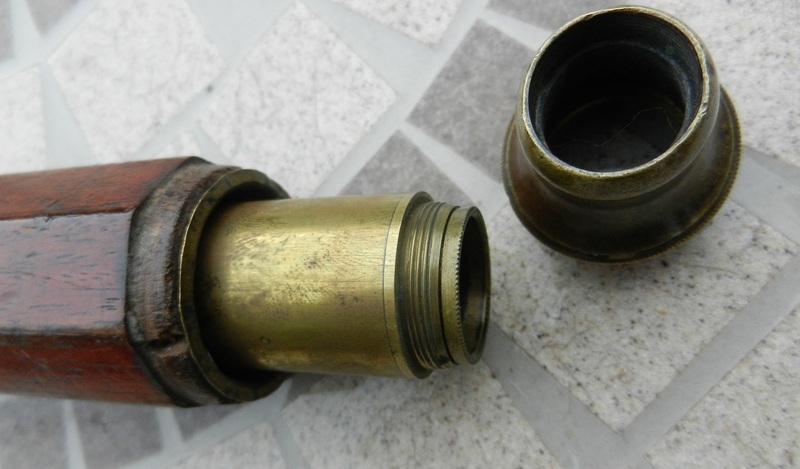 As can be seen, the only thing missing is the bezel on the eyepiece end of the main barrel, which also means that when in use the brass draw can be out of line with the axis of the barrel and objective, so it needs to be held in the correct position carefully: but then the telescope works very well. Three lenses are present in the single draw, one at each of the splits in the tube, and each lens is held in place with its own internal bezel. The three lenses are equi-spaced, presumably in what Dr Chris Lord would describe as a Schyrlean eyepiece arrangement. 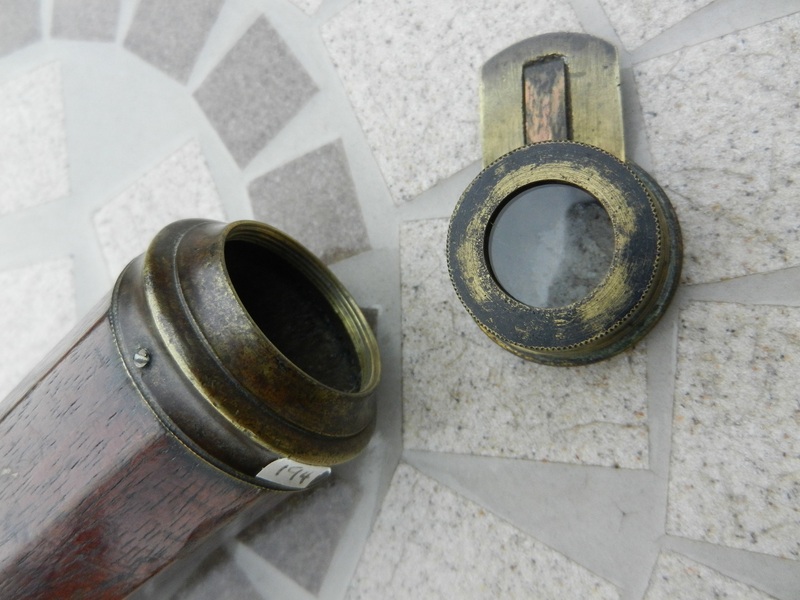 There is no slider to protect the eye lens, but it is well recessed below the bell housing: the telescope can appear to be slightly easier to use without the bell housing in place, which possibly explains why sometimes these pieces are missing. The magnification is reasonably good, but at times the view can show some chromatic aberration at the edge. This comes from the single lens used as the objective, ie it does not use the Dollond patented dual objective lens. The objective only has a visible used diameter of around 0.6”, in the mount, which is a part of the protective slide assembly at the end of the barrel: the actual barrel is much bigger, about 1.375” across the flats of the octagon – this restriction is presumably deliberate so as not to use much more than the central part of the lens, which can reduce the effects of chromatic aberration. Total length fully open is approximately 23”. There is one orifice restricting the light transmission from the edges of the view, near the final eyepiece lens. So, having now re-located this telescope it now needs a little careful cleaning! 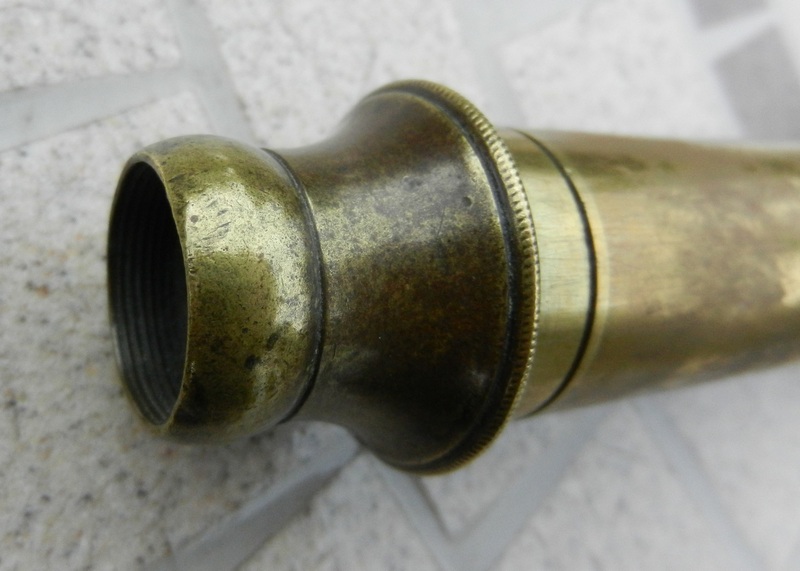 Since the Dollond Patent expired in 1772, it seems likely that this telescope was produced in the early 1770s, since after 1772 the lens doublet became fairly standard with London instrument makers. I have to say having been struggling all afternoon to get a Ramsden to work properly, picking up this old little telescope was a real pleasure! While the magnification might not be quite as much as the Ramsden, it worked so easily. Then you think it has such a small objective (to reduce the chromatic aberration with one lens in there) but still delivers at least 10x magnification and a good field of view. Plus the definition of the image is brilliant (have I been looking at dodgy digital photos too much?) and with the ease of focusing, this telescope is a little masterpiece. Yet possibly 240 years old. Plus it focuses down to 12 feet away …..but it does get a bit wobbly without that bezel! After polishing the brass the Chapman telescope looks much more desirable: but the wood seems to look right i its used and battered state. Photos coming below.